Last weekend my 4 year old was recovering from a tummy bug, so we had to shelve plans to go and explore a new (to us) local park with a flask of cocoa, and stuck close to home instead. So it was perfect timing that the Weekend Box Club sent us one of their winter boxes free of charge for review – weekend saved! 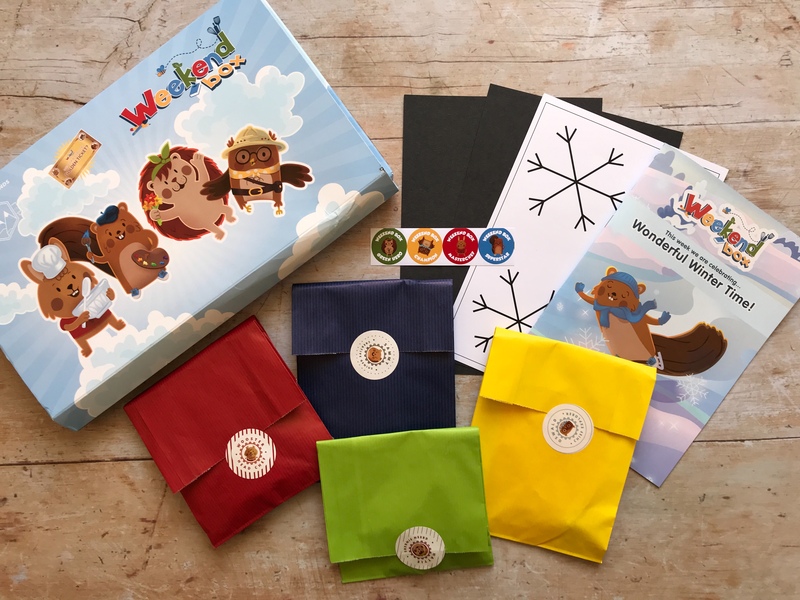 The box contained four activities – “something to make, bake, explore and more” – each one introduced by one of four cute characters: Wooster Rabbit, Sammy Squirrel, Oswald Owl and Hattie Hedgehog. 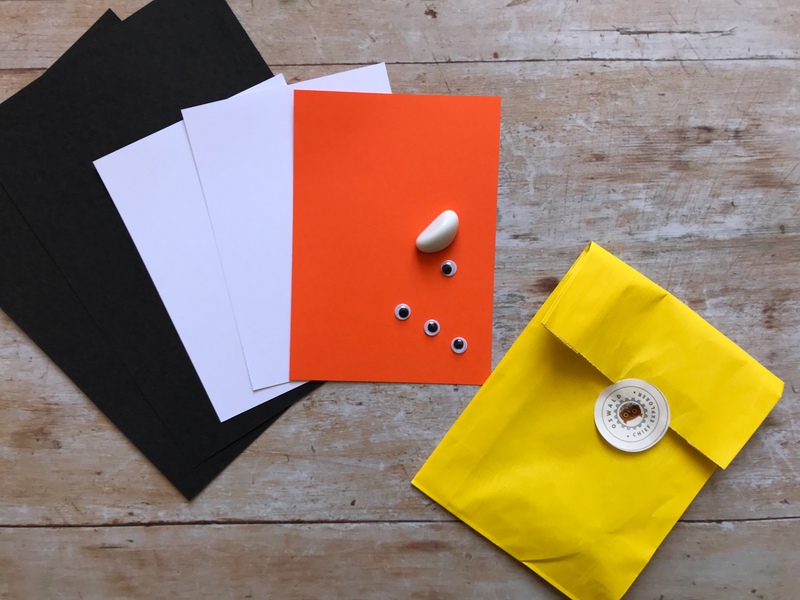 Each activity comes packaged in a little paper bag, and includes all the materials you need apart from a few staples that everyone would have at home, like a bowl and spoon for baking, or scissors and a pencil for crafting. 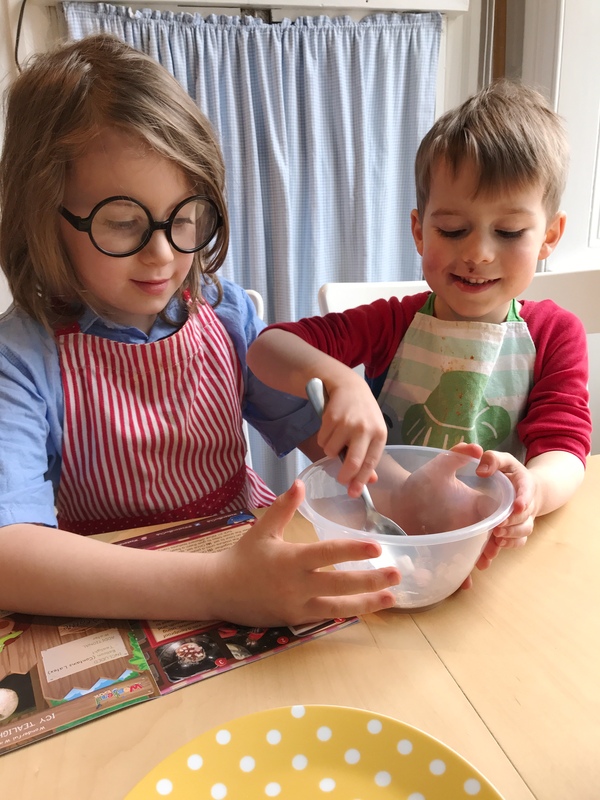 We decided to start with the baking activity, which was making Rocky Road Snow-Bites with Wooster Rabbit. 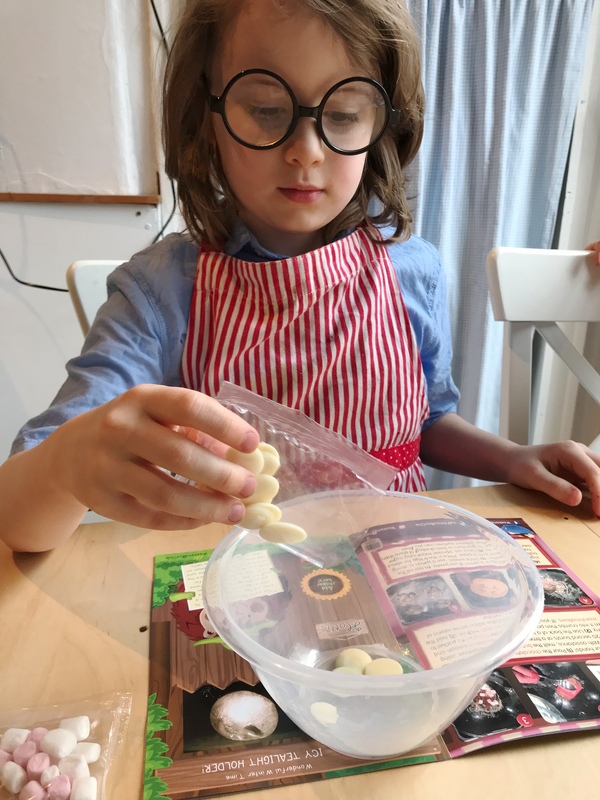 My 4 year old, who had originally said he didn’t want to take part in the box, came running when he heard there was baking involved – he loves helping in the kitchen! 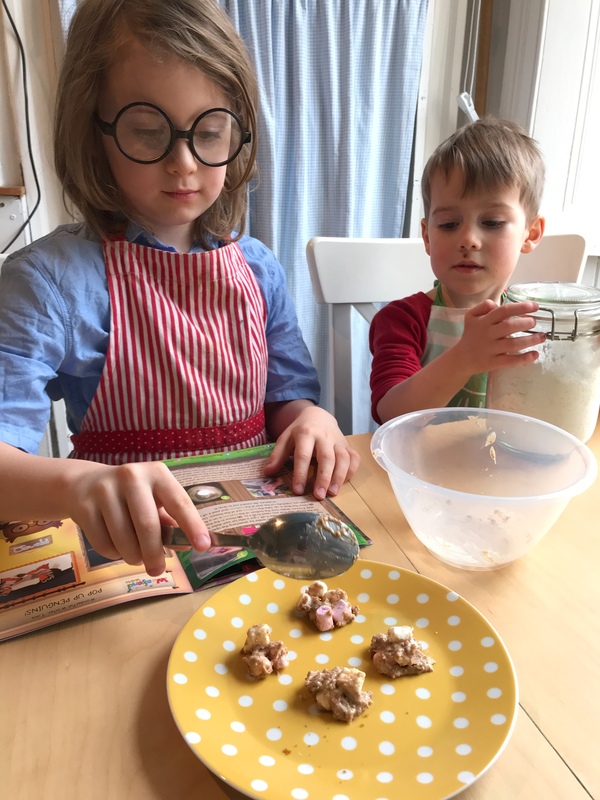 The boys took it in turns to add and mix the ingredients, and then we popped the rocky road bites in the fridge to set whilst we moved on to the next activity. 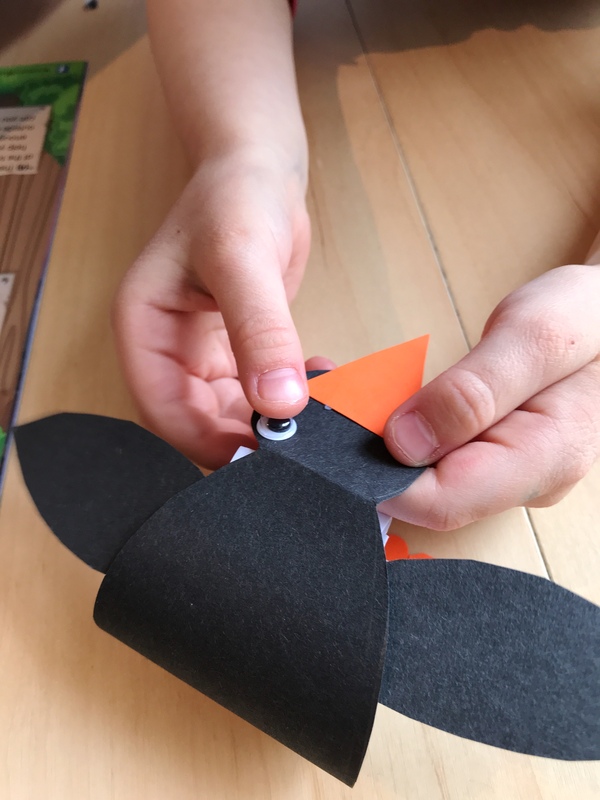 We decided to try Oswald Owl’s craft activity next, which was making pop up penguins! 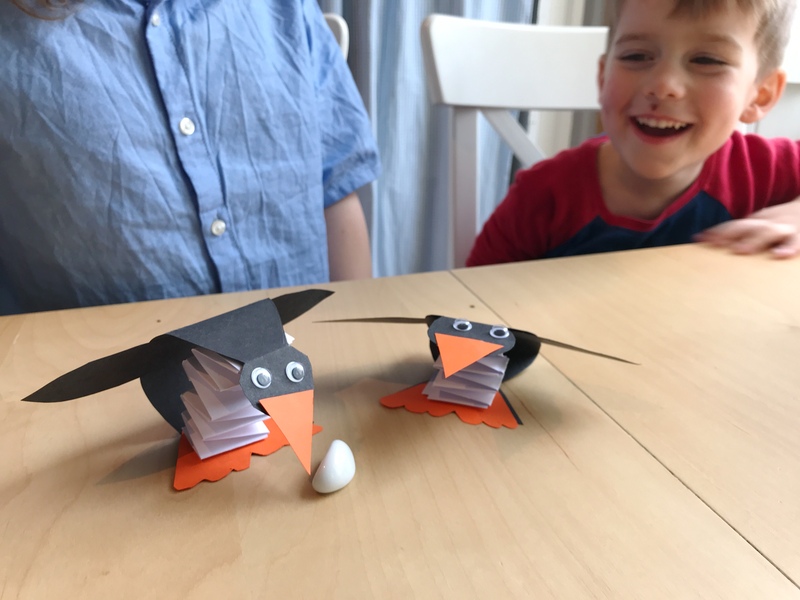 There were enough materials to make two penguins, which was perfect as the boys could make one each. 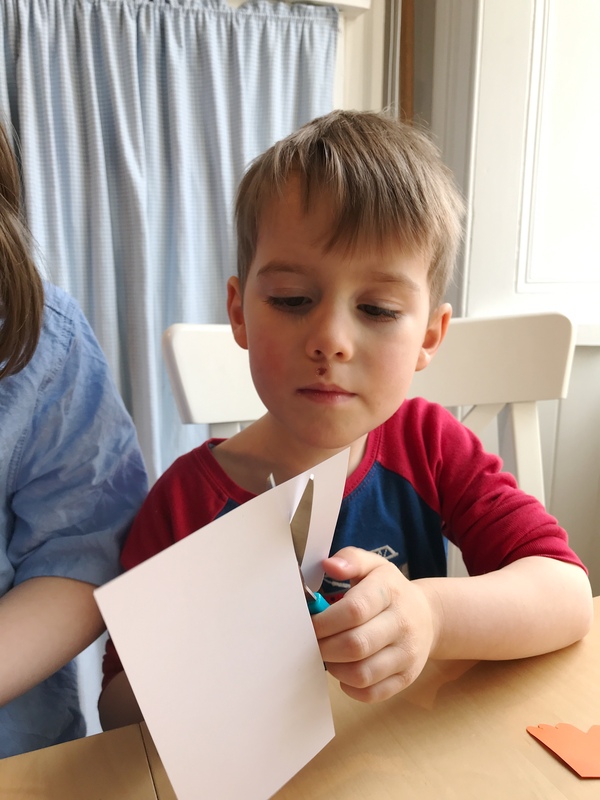 I had to help my 4 year old a little with the cutting and glueing, but my 8 year old managed very well on his own. Half an hour later, we had two cute penguins being bounced around the kitchen table. We learned some interesting facts about penguins too, in the little instruction booklet that comes with the box. Just as we finished the penguins, the beeper went off, signalling that the rocky road bites were ready. 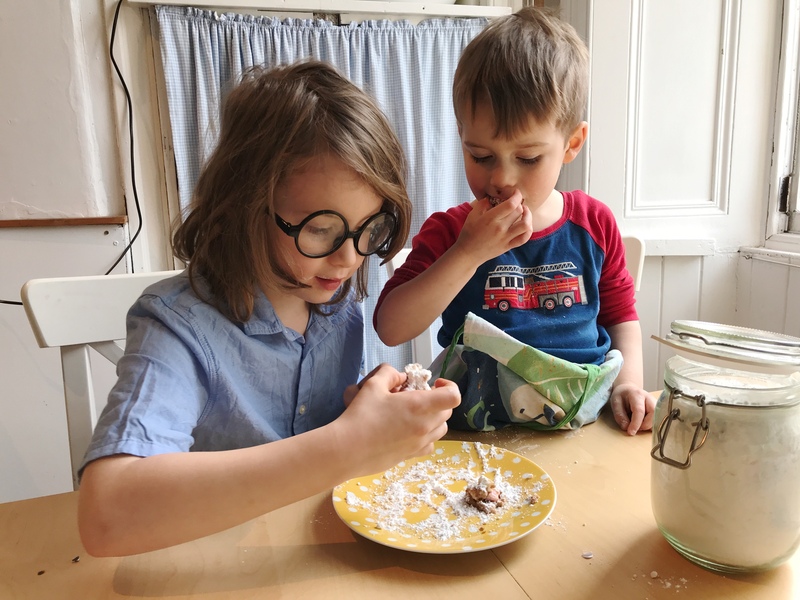 After a quick dusting with icing sugar, the boys couldn’t wait to dig in! 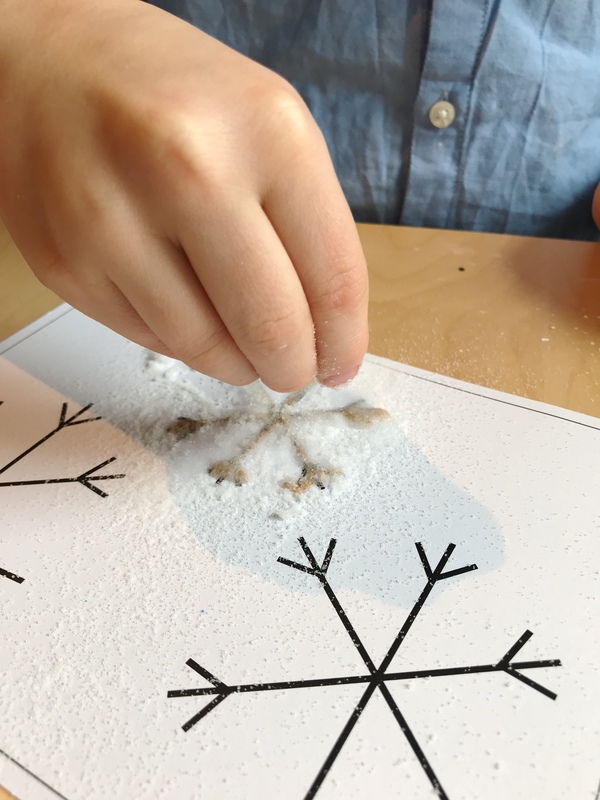 The final activity that were tried at the weekend, after a short break, was making salt snowflakes with Sammy Squirrel, which involved a glitter glue pen and water colour paints. 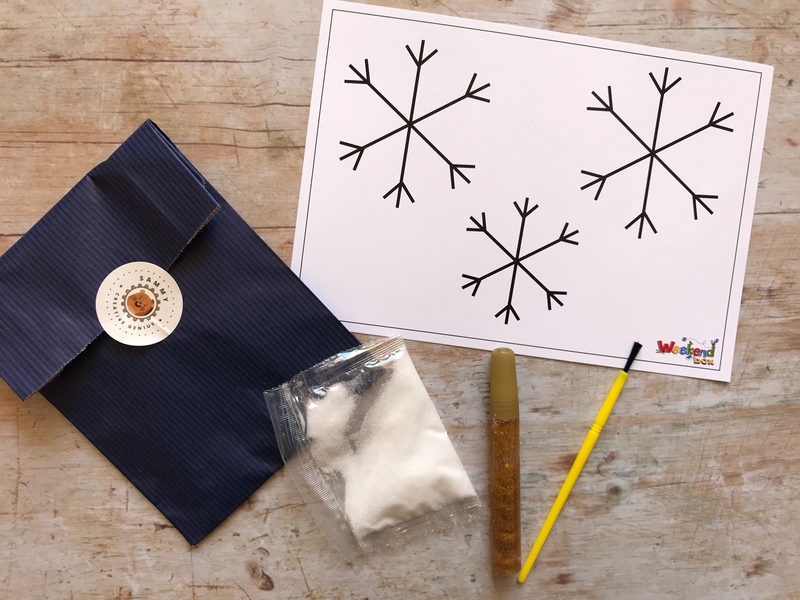 There was a template included, though you could also free-hand your own snowflakes. 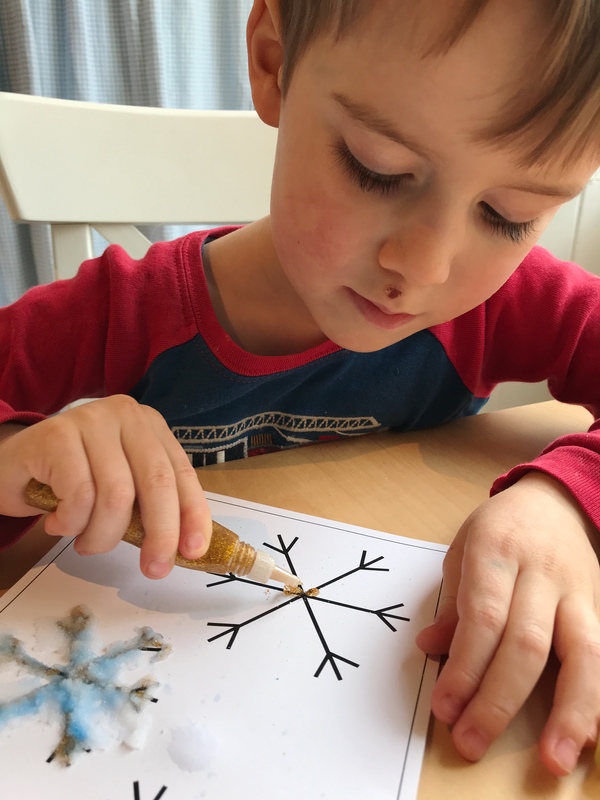 The boys took it in turn to have a go, and tracing the snowflakes was great for their fine motor skills, hand control and patience. 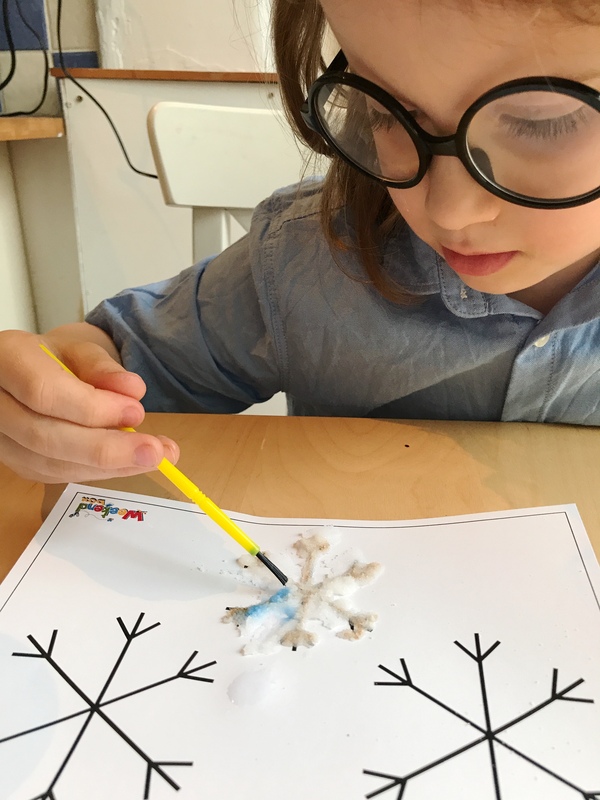 There was one last activity in the box – making an icy tealight holder with Hattie Hedgehog, but we have saved that for another day as it involves freezing something for 4 hours, and by the time we had realised this it was already too late in the day. 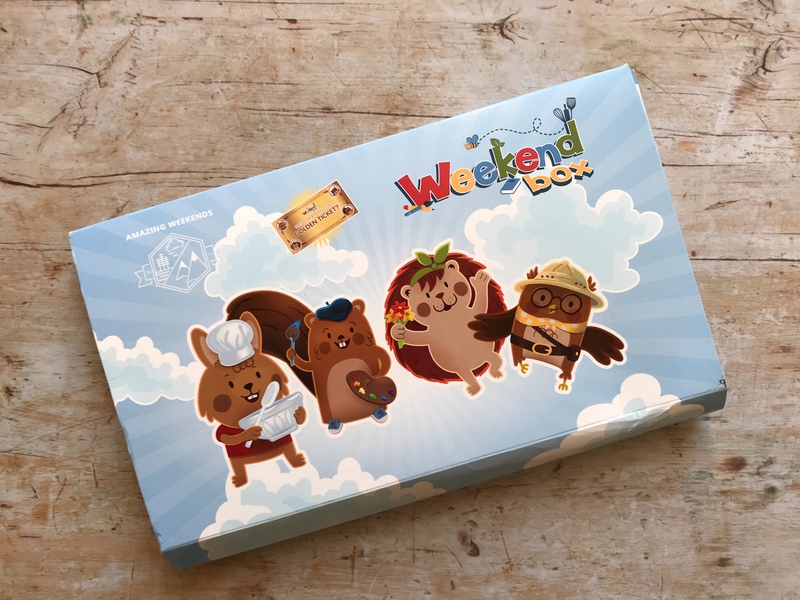 As well as the activities themselves, the Weekend Box comes with a couple other things. First, there is a set of stickers that you can stick in the booklet once you have completed each activities. The booklet also included some jokes, a word search and a word puzzle, a colouring page, and a comic strip to complete. On the back of the booklet is a certificate that you can also colour in and write in your name once you have completed all the activities, and the inside of the box had a door hanger to colour in and cut out. 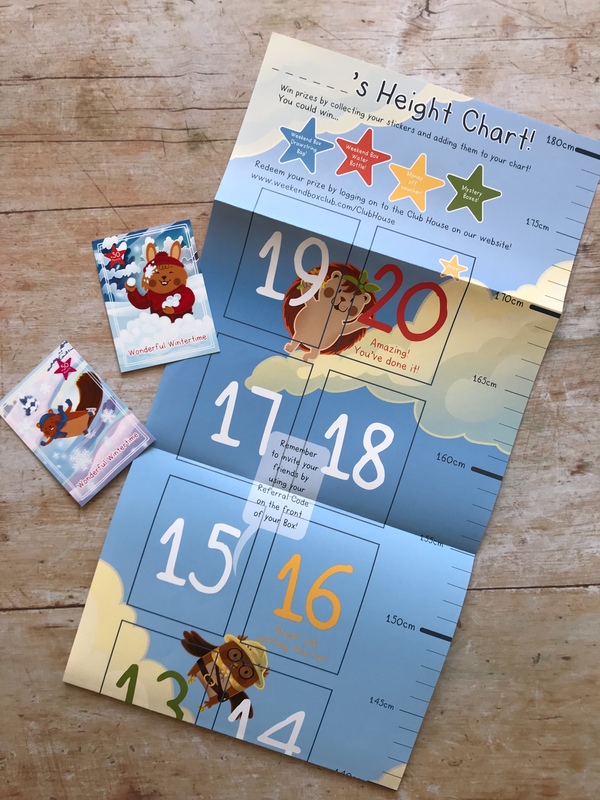 Last but not least, the box also included a height chart, which doubles up as a sheet for the collectable stickers that come with each box – each stickers gives you points, and if you collect enough you can exchange them for prizes. The Weekend Box Club is aimed at children aged 3 to 8. My boys are 4 and 8 and both enjoyed it, though the little one did need a bit of help. You can subscribe to get either fortnightly or monthly mailings. The Bumper Boxes with four activities in them cost £8.95 each, or you can also opt for a Mini Box with just two activities, which costs £5.95. Delivery is included in the prices. Although my boys did just fine sharing the box, you can also add on a sibling for an extra cost, which works out cheaper than ordering two individual boxes. All further terms and conditions are detailed on the Weekend Box Club website. We have tried out quite a few different craft and baking boxes in the past, and this has definitely been one of our favourites. 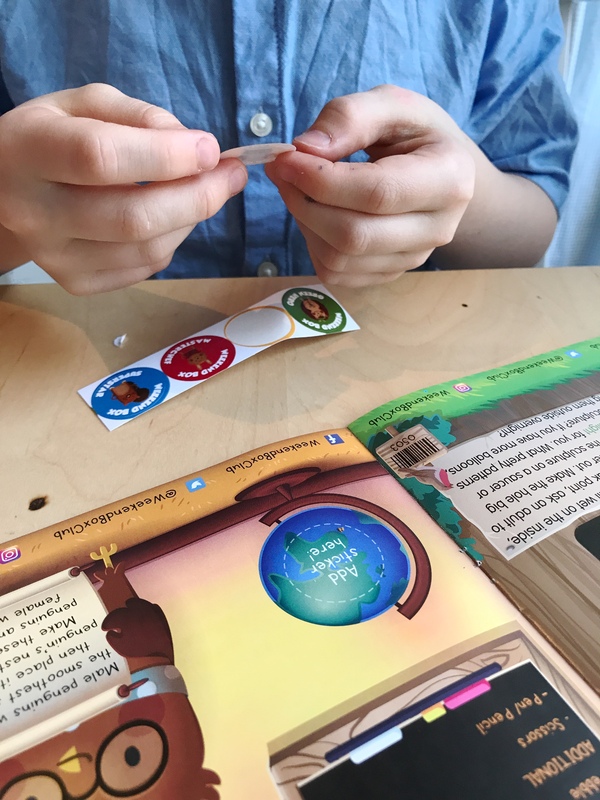 We love the mix of activities, with both crafting and baking, and all the other little extras that you get like the stickers, colouring sheets, certificate etc. Weekend Box Club gets a thumbs up from us. 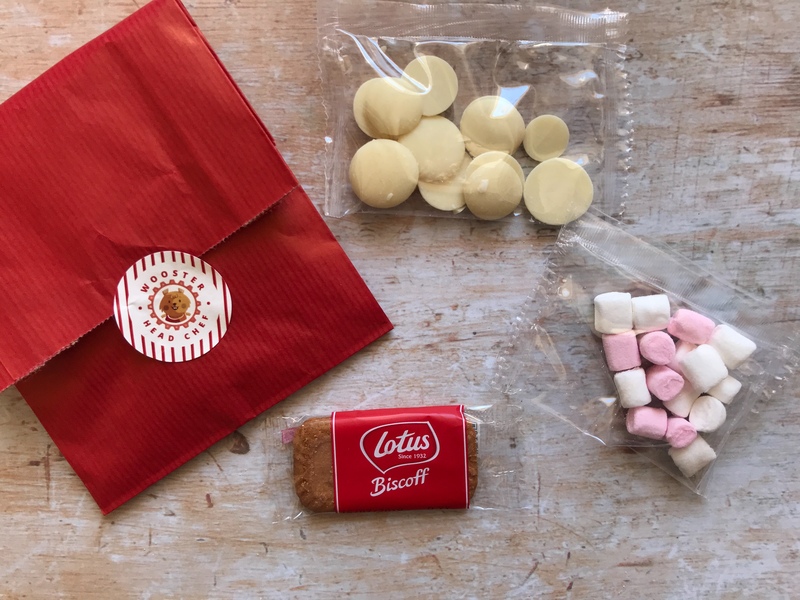 We’ve actually had a subscription in the past before, but stopped when Oskar received a science box subscription for his birthday AND then we won a baking box subscription, and it was getting a bit overwhelming with all these different boxes arriving all the time. But we would definitely consider another Weekend Box Club subscription in the future! 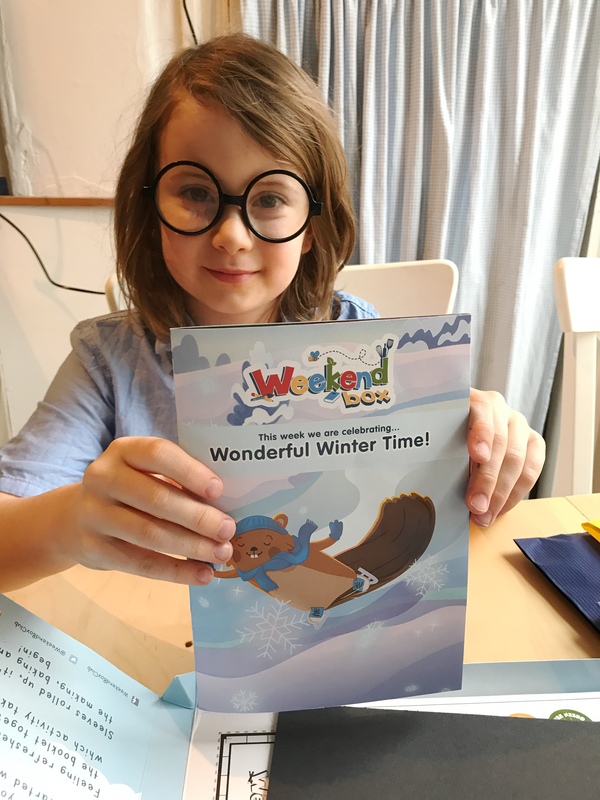 Disclosure: We received a Weekend Box Cub Winter Box free of charge, in return for an honest review. All images, words and opinions are entirely our own. These boxes look great. I have been thinking about setting a subscription for my daughter as I think she’d love it. What a great idea. I always get stuck for things to do when it’s a rainy day and this would be fab to keep my daughter entertained. She would also love that it arrived through the letterbox just for her. What a fantastic idea! 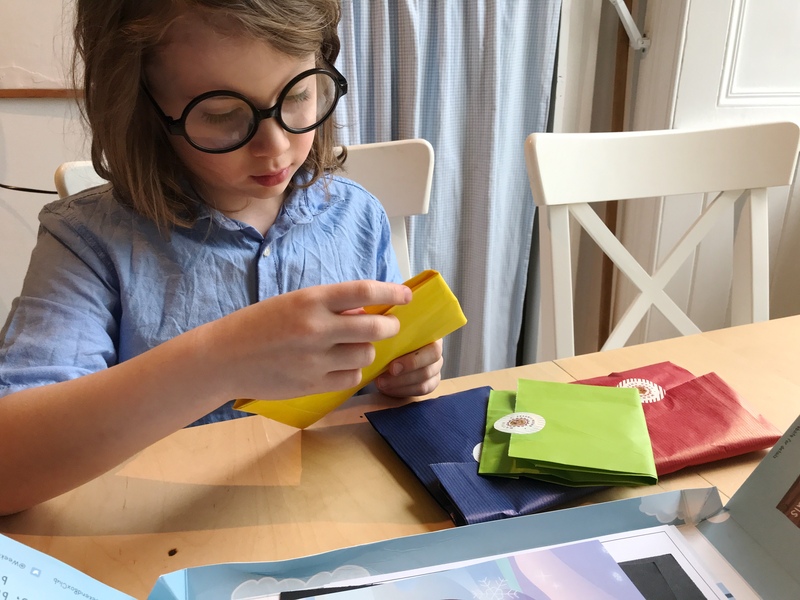 I love boxes like these, and something for the weekend is a really clever way of keeping the little ones motivated and get those creative juices going. This box looks so perfect. Lots of good rainy day activities and hands on fun! My daughter would love this. I love those little pop up penguins and the rocky roads looked delicious! The weekend box looks great! 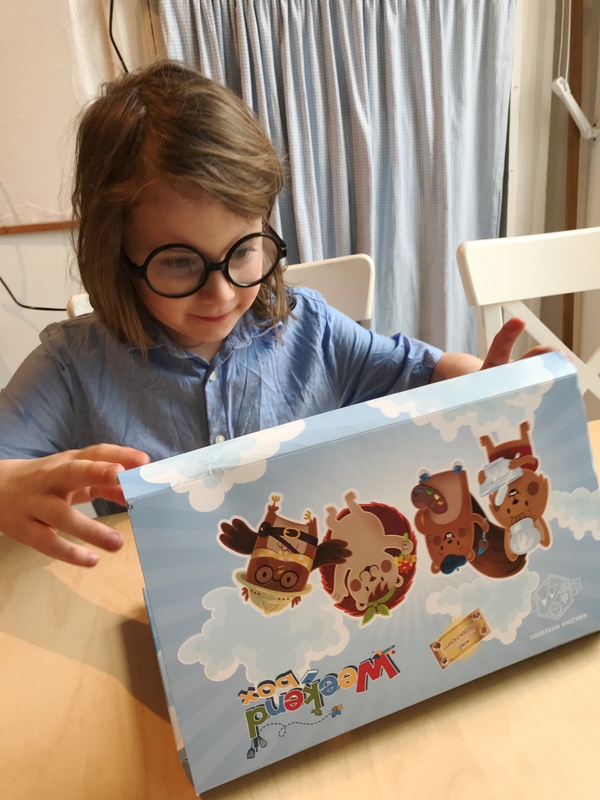 My son is still too young for subscription boxes but they seems like a fantastic way to keep little ones amused. This looks like a fun little subscription box! There are so many aimed at children now it can be hard to find something you know they’ll actually enjoy/won’t get bored of. So this one having four activities all being a bit different sounds great.